Organic can be expensive. Budgets are often tight. 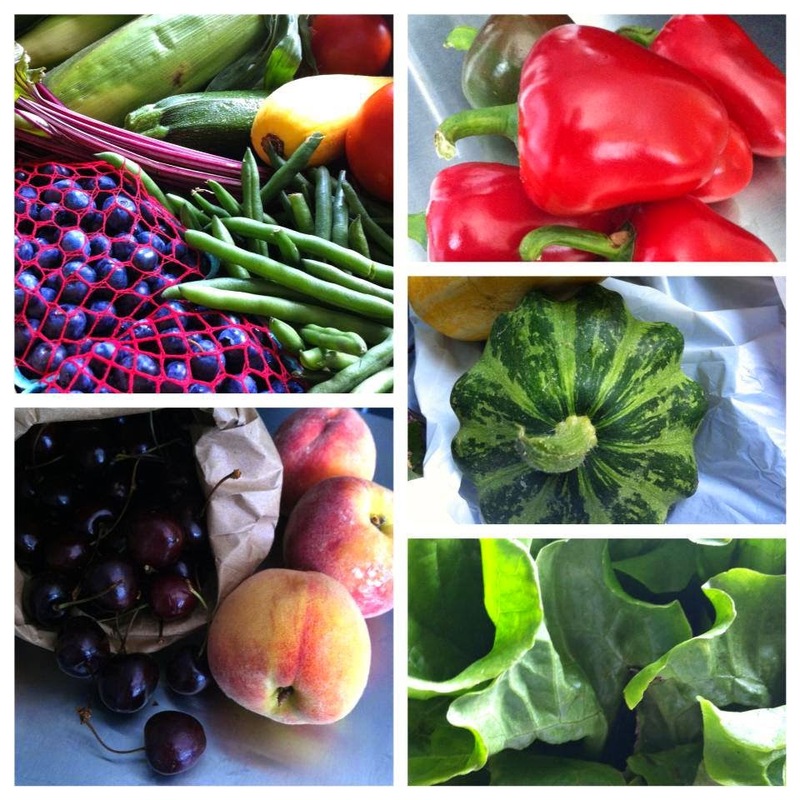 When you can't find or afford to go organic for everything on your grocery list, how do you decide when to go organic or not? 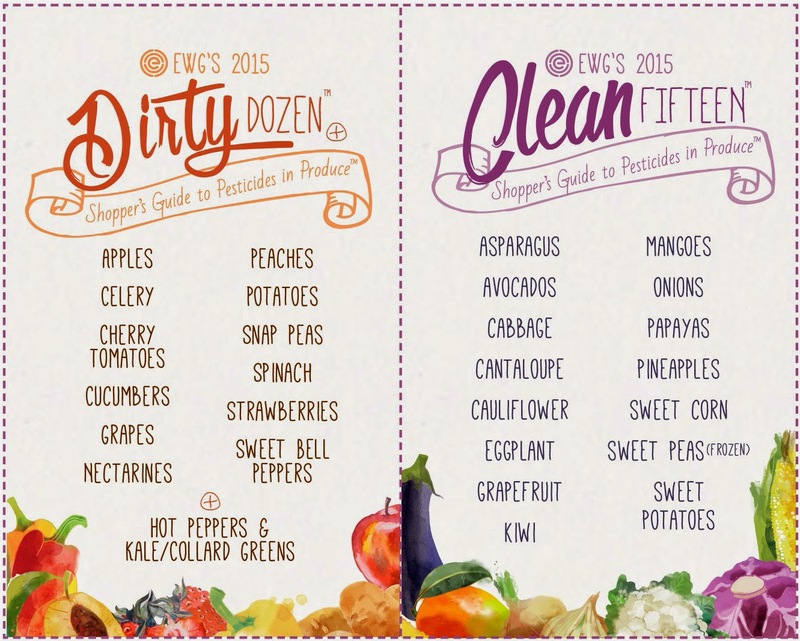 I think a great start is The Environmental Working Group's 2015 Shopper's Guide to Pesticides in Produce™. The Guide ranks 48 different fruits and vegetables by the total number of pesticides found on them. The guide is based on testing by the USDA and the federal Food and Drug Administration. The "Dirty Dozen" are the twelve most contaminated fruits and veggies. The "Clean 15" are the least contaminated. There is also a Dirty Dozen Plus list. Once again, Apples have the dubious honor of being at the top of the Dirty Dozen followed by: Peaches, Nectarines, Strawberries, Grapes, Celery, Spinach, Sweet Bell Peppers, Cucumbers, Cherry Tomatoes, Snap Peas - Imported, and Potatoes. Then there are two items in the Dirty Dozen Plus category - Kale/Collard Greens and Hot Peppers. These produce items are of special concern for public health because residue tests conducted by the U.S. Department of Agriculture have found these foods laced with particularly toxic pesticides. USDA tests of 739 samples of hot peppers in 2010 and 2011 (USDA 2010, 2011) found residues of three highly toxic insecticides on a portion of sampled peppers at concentrations high enough to cause concern. These insecticides are banned on some common crops but still allowed on hot peppers. The Environmental Working Group (EWG) recommends that people who frequently eat leafy greens and hot peppers buy organic varieties. If you cannot find or afford organic types, they suggest cooking them, because pesticides levels typically diminish when food is cooked. For a bit of positive news, Avocados were again the cleanest, with only 1 percent of samples showing any detectable pesticides. Other items on the Clean Fifteen list include sweet corn, pineapples, cabbage, frozen sweet peas frozen, onions, asparagus, mangoes, papayas, kiwi, eggplant, grapefruit, cantaloupe, cauliflower, and sweet potatoes. Nearly two-thirds of the 3,015 produce samples tested by the U.S. Department of Agriculture in 2013 contained pesticide residues. EWG's Shopper's Guide to Pesticides in Produce calculates that USDA tests found a total 165 different pesticides on thousands of fruit and vegetable samples examined in 2013. 99 percent of apple samples tested positive for at least one pesticide residue. A single grape and a sweet bell pepper sample tested positive for 15 pesticides. Single samples of celery, cherry tomatoes, nectarines, peaches, imported snap peas and strawberries tested positive for 13 different pesticides apiece. It's important to keep putting our money where our mouths are and continue to go organic whenever possible. And for when we can't, these guides are a great reference.